It’s cookbook giveaway time and this one is a jewel! James Beard award-winner Dorie Greenspan has the most amazing cookbooks. I have her books and have not made one single recipe yet that hasn’t turned out perfect. The recipes in this cookbook were gathered from Dorie’s years of living in France. They are renditions of the classics, yet simple and spectacular. The book is also packed with lively stories, memories, and tips on French culinary customs. It also won Book of the Year from The IACP Cookbook Awards. If you already have this cookbook, then lucky you. But that doesn’t mean you still can’t enter. Maybe you would like to give it to a friend or loved one for Christmas or a birthday gift. If you don’t have this cookbook, then you must enter. Don’t miss out on a chance to win, when all you have to do is leave a comment and that’s it! You must leave a comment here on the blog. Not on my Facebook, Twitter, Instagram, or anywhere but here or it won’t count. Tell me why you would like to win the cookbook; or you can tell me your favorite French food. The drawing is open only to readers who live in the Continental USA. Sorry, but postage is too expensive elsewhere and this book is very large and heavy. The Culinary Cellar is not responsible for late, stolen, lost, or damaged mail. The winner will be chosen randomly using random.com. Comments can be started anytime today, Friday, November 20, 2015, and will end at 11:59 pm CST on Monday, November 30, 2015. The winner will be announced on my Wednesday blog of December 2, 2015. I will mail the book out to the winner right away in time for Christmas. Good luck, everyone!! This book will make you happy! P.S. I wrote a blog about this cookbook with a recipe last January, if you want to go check it out! And if you want to read about an earlier and now closed Dorie Greenspan book, Baking Chez Moi, that I gave away along with another one of her great recipes that you can try, read about it on my blog here. I would love to win this book because I have many of her other books and this would complete my collection! Oh, and my favorite French food is Crepes!! Love her books. Would love to add this one to my collection, as it’s skimpy in the area of French cuisine! Thanks for the opportunity, Debbie! I do not have a French cookbook and would so love this Dorie Greenspan one. Thanks, Debbie, for the opportunity to win. Oh fun! A cookbook giveaway! 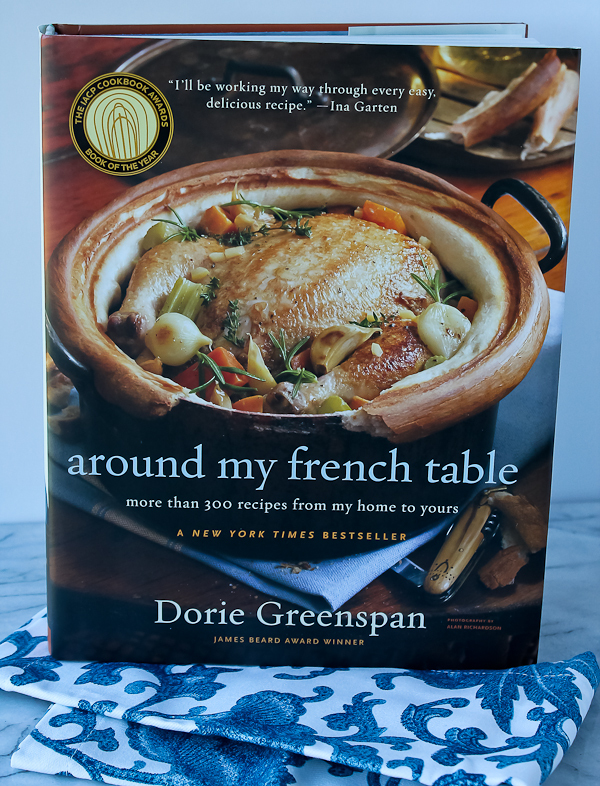 I would enjoy adding Dorie Greenspan’s French cookbook to my cookbook collection. It sounds like a book I certainly would enjoy with classic recipes and lively stories. We love French food — Alex worked in France for 4 years (before he met me) – so, though I’ve visited — I am not as ‘familiar’ as he is. French Onion soup and Steak au Poivre (sp?) are two family favorites! Would enjoy the book if I’m lucky! I love cookbooks and this looks like a good one to have on hand. I would love to win this book because I could randomly pick a recipes to cook this coming new year to remind my hubby and I of our lucky 19 hour layover in Paris two years ago, just before we brought my mother in to live with us. It will be a while before we can take a trip like that again so this would help bring back some fond memories. I don’t have any French cookbooks and would love to add one to my small bookcase! I really enjoy scallops so Coquilles Saint-Jacques is one favorite or a nice ratatouille with fresh vegetables. Finish up with a chocolate souffle! Thank you for the giveaway and hope you have a wonderful Thanksgiving! This would be a welcome book to my collection. I don’t know why I am intimidated to try more French recipes since I love them so much. My favorite French dish is Croque Monsieur. There was a small French restaurant where I worked in NY years ago by the United Nations. Every Friday when it was payday, that is where you would find me. Thanks for the giveaway Debbie! I would love to win this as I don’t own any French cookbooks, and this one looks lovely! I am always looking for new recipes for my family. So, it would be cool to win the book! My mom loves to cook and has an awesome collection of cook books! She would love to receive the book. Thanks for the chance! I want to learn how to make Pommes Frites like they serve at Bouchon. I would like to win because I have never made any of Dorie’s recipes before. I have been cooking with whole foods for about 6 months and the recipes in this book are right in line with how I want to be cooking. I think I could learn a lot from having this cookbook.